Don Strange had a stellar year in 1990 and his manager at single-A Sumter recognized that, according to The Sumter Item. Strange went 4-1, with 24 saves as the Sumter closer. His ERA didn't even break 1, coming in at 0.66. "He gets the job done," manager Ned Yost told The Item. "The funny thing about it is that we haven't seen the real Donnie Strange except for about five or six appearances this season." Strange ultimately pitched in eight professional seasons. He made AAA, but he never made the majors. 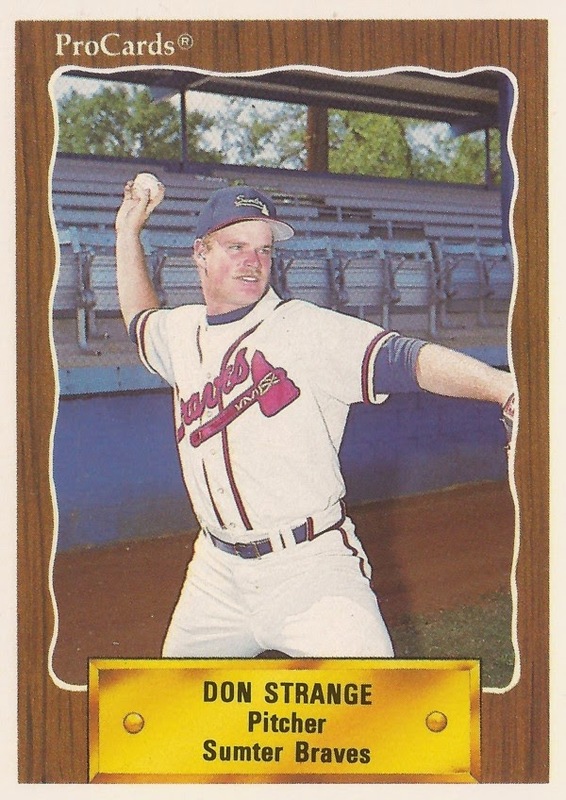 Strange's career began in 1989, signed by the Braves as an undrafted free agent out of the University of Massachusetts. He played his first season at rookie Pulaski. In 27 relief outings, he picked up five saves and a 2.45 ERA. Strange moved to Sumter for 1990. He picked up the first of his 24 saves that year in early April. In late-August, he got his fourth win in a three-inning relief effort. He got promoted to high-A Durham in 1991 and he also got four outings at AA Greenville. He had a 1.79 ERA in 38 outings at Durham. His four outings at Greenville ended with seven earned over 4.2 innings. Strange played exclusively at Greenville in 1992, posting a 2.40 ERA in 48 outings. He also saved 18 games. His third save came in late April, Strange striking out all three batters he faced. Strange first made AAA in 1993 at Richmond. In 34 outings there, he a 3.88 ERA. He started 1994 back at Richmond, but moved mid-year to the Royals and AA Memphis. Strange played two more seasons as a pro, between AA and AAA for the Royals iln 1995 and at AA Bowie with the Orioles in 1996, ending his career.